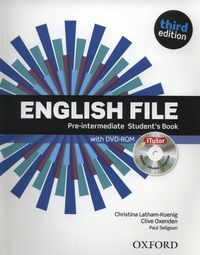 English File Third Edition Pre-intermediate Student's Book Pack (iTutor). Nowe wydanie bestsellera. Jeżeli chcesz kupić English File Third Edition Pre-intermediate Student's Book Pack (iTutor) w ilościach detalicznych zapraszamy do naszego sklepu internetowego edugaleria.pl.